The 4,500 square foot, indoor-outdoor space on the ground floor celebrates the natural beauty of its surroundings incorporating the tropical, waterfront environment as a design element. 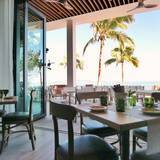 The restaurant includes indoor space for 150 seated, 200 standing, with floor to ceiling windows offering dramatic Biscayne Bay views, as well as outdoor waterfront deck space for 70 seated, 100 standing. On the second floor, an indoor-outdoor lounge space is also available for cocktail receptions of up to 150 and a fully private indoor dining space accommodates up to 12 guests for more intimate gatherings. Please fill in your information below and Lindsay Guidos will contact you as soon as possible to book your event. If you’d prefer to talk now, please call us at (866) 479-2572.